Every community develops its own institutions over time, which in turn shape the neighborhoods they serve. St. Mary’s Orphan Asylum, founded in 1853 was one of Vailsburg’s oldest such agencies. St. Mary’s Orphan Asylum was designed to be a 'Catholic organization for both sexes,' and it served orphaned children. Those between 4 and 13 were placed in the asylum and those between 14 and 18 were assigned to its Asylum Industrial Department where they were taught a trade such as dress or lace-making. The first orphanage was on Nesbitt St. near St. Patrick’s Cathedral. It later moved to Vailsburg in the 1880s to the site of the old Fairchild Mansion. Incorporated by state law in 1853, during the administration of Bishop James Roosevelt Bailey, the orphanage had a five-person board of trustees, including the pastor of St. Patrick’s who served as president. For many years, the group of brick buildings, built around a 1790 farmhouse, was one of Vailsburg’s best known landmarks. In 1892, a second Catholic institution, Sacred Heart Church, was founded at South Orange and Sanford avenues under the leadership of Bishop Winand M. Wigger. In 1926, the church-school was moved 40 feet so that the church building could be constructed on its present site. The magnificent building we see today, with a seating capacity of 2,400 at the time of completion was described by the local press as 'the largest parish church in the nation'. The Italian Renaissance structure was designed by Neil J. Convery of Walnut Street, Newark, and was built by William II and William J. Fissell. It is 211 feet long, 65 feet wide, and 142 feet high, and its tower rises 168 feet above South Orange Avenue. Interior decoration was designed by John Earley. The church’s altars are particularly noteworthy. The windows represent the 12 apostles and various saints, designed locally by John Hodge and John Farrell. The three-manual organ is used to play the fine exterior tower chimes. Not to be confused with Newark’s great cathedral and Basilica of the same name, Sacred Heart Church of Vailsburg is indeed one of the city’s finest religious buildings and a prominent architectural site in Vailsburg. The show place of Vailsburg was the old Stanley Theatre on South Orange and Stuyvesant avenues. Completed in 1927, it was hailed by the local press as one of the most unique theaters in the city, state, and region. Built by the Stanley-Fabian Theatre chain it was one of several Stanley properties in Newark including the Mosque, Branford, Capital, and Goodwin theaters. 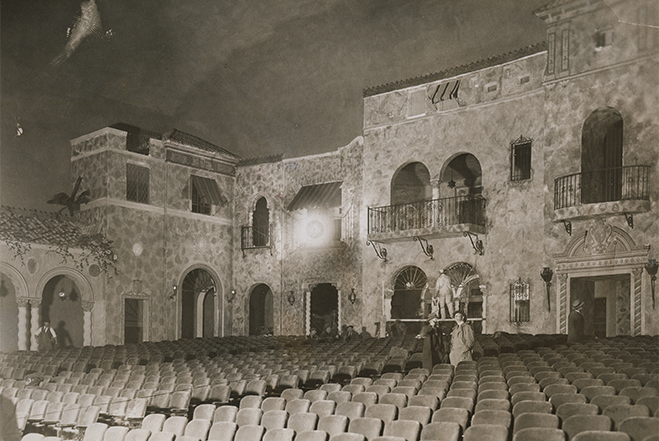 The Stanley was designed in Spanish-style and was one of several 'atmospheric theaters' in the United States, a theater whose ceiling would light up with tiny stars or where clouds could roll by as the movie mood demanded. The 2,000 seat auditorium was designed to look like a courtyard in a Spanish city complete with windows, doors, and garden decoration. The Wurlitzer organ was considered by many to be the state’s best. Excitement was great on opening night when it seemed as if all of flag-draped South Orange Avenue turned out to listen to Charles P. Gillen praise the new theater and the community alike. The opening night movie was 'The Fire Brigade' starring Charles Ray and May McAvoy. How proud Vailsburg residents must have been to have a movie palace that rivaled Newark’s great downtown motion picture temples or even their counterparts across the Hudson. With the passing of the movie era, the building because the Casa Italiana – the Father Vincent Morella Center of Italian Culture. More recently, it served as a church. In addition to architectural sites and traditional landmarks, a community is made up of people and organizations that care about each other. One such organization in Vailsburg is the Unified Vailsburg Services Organization (UVSO) established by a handful of clergy following the riots in 1967, which shook not only the city but the nation. Created to establish a 'stable and compassionate community in the midst of near chaos and calamity,' the UVSO pledged to resolve personal and community problems before they became neighborhood missionaries. Its menu of services is long and varied. From the original UVSO offices at Richelieu Place, to its new headquarters at South Orange and Sanford Avenue, attention has and is available for both the elderly and the young, for helping with physical and mental health matters, assisting with the Meals on Wheels program, supporting scouting activities, providing community monitoring, repairing and replacing dilapidated housing stock, and working with similar agencies, also devoted to making life just a bit easier and nicer. Mike Farrell, executive director, sees his group as an umbrella agency which is constantly monitoring the area’s changing needs and its people—a place where problems can be discussed and solved, an agency where people share their concerns with neighbors and colleagues. A few hundred words cannot really tell you all you need to know about Vailsburg or any of Newark’s 'cities within a city' but hopefully you get the point—that Vailsburg is both historical and a good place to visit or live.